OTT Tänak is on course to secure for his maiden WRC win after extending his lead of PZM 73rd Rally Poland at the end of Saturday’s second leg. Driving a Ford Fiesta RS, the 28-year-old Estonian completed the longest leg of the four-day event 21.3sec clear of Andreas Mikkelsen’s Volkswagen Polo R, with Hayden Paddon completing the provisional podium a further 6.5sec behind in a Hyundai i20. Victory for Tänak, co-driver Raigo Mulder and their independent DMACK Tyres team would add more spice to an FIA World Rally Championship season that already has thrown up unexpected results. He would be the sixth different driver to win in seven rounds, breaking the three years’ dominance of Volkswagen and its world champion Sebastien Ogier. It also would be the first Ford win in almost four seasons and finally cap Tänak’s status as a top driver after several difficult seasons. He drove for the official M-Sport Ford squad in 2012 but was dropped in 2013, then reinstated in 2015 before literally hitting his lowest point when his Fiesta sank to the bottom of Mexican lake after a crash. This year he moved to the DMACK team and has shown strong form. Tänak was imperious in his Ford Fiesta RS on Saturday morning. He won all three speed tests to increase his lead from 4.2sec to 18.0sec, making the most of better grip than his rivals further up the start order who swept the sandy roads. Road conditions were more equal when the stages were repeated in the afternoon. Mikkelsen initially regained a few seconds before Tänak stemmed the loss, leaving the Estonian looking forward to Sunday when heavy rain is forecast to replace Saturday’s 30˚C temperatures. “I’m relaxed and hope I have enough in hand for tomorrow. I’ve led for the last two days so why not tomorrow? I was flat out in every corner this morning and did everything I could to extend the lead. I knew the afternoon would be tough in the extreme heat, it’s not easy for the tyres,” he said. Mikkelsen overshot a junction in the final long stage as he gave his all to peg back Tänak. “I was at the maximum everywhere. I couldn’t go faster, not one bit. We have to take big risks to fight at the top if we want to – and we want to,” said the Norwegian. Paddon was happier with his car’s set-up after overnight changes. His driving was ragged at times as he struggled to tame the i20 in the loose morning stages, but the New Zealander remained hot on Mikkelsen’s heels. Thierry Neuville climbed to fourth in the opening stage. The Belgian survived a bizarre incident when his i20’s gear stick broke and fell into the footwell and he also complained his pace notes were too slow for the roads, which were more technical than Friday’s but still lightning-fast. Jari-Matti Latvala overshot a junction en route to fifth in a Polo R. The Finn finally found his rhythm and overhauled despondent teammate Ogier, who was on a hiding to nothing in the sandy conditions from his position as road opener. Stéphane Lefebvre scored his maiden WRC stage win in the afternoon as he retained seventh ahead of Abu Dhabi DS 3 teammate Craig Breen. Eric Camilli and Mads Østberg completed the leaderboard. In WRC2, Australian Scott Pedder climbed from 10th overall on Friday to eighth at the end of Saturday, but has struggled to find speed in his Skoda Fabia R5. Sunday’s final leg is the shortest with just 59.60km of competition. 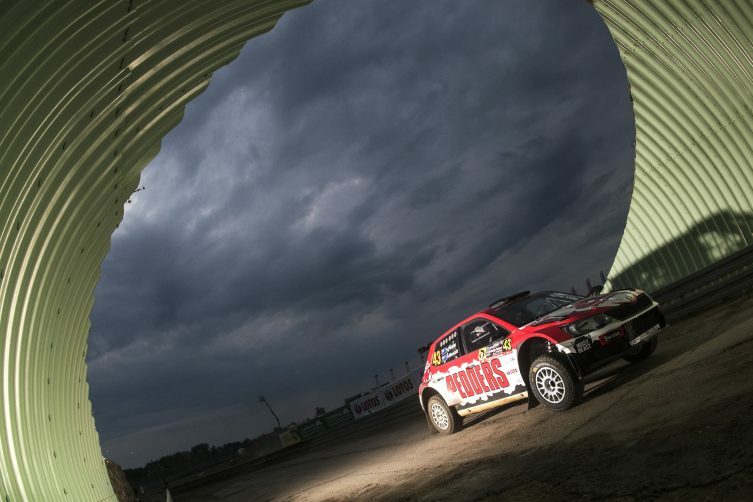 Drivers tackle two identical lops of stages, split by service in Mikolajki.